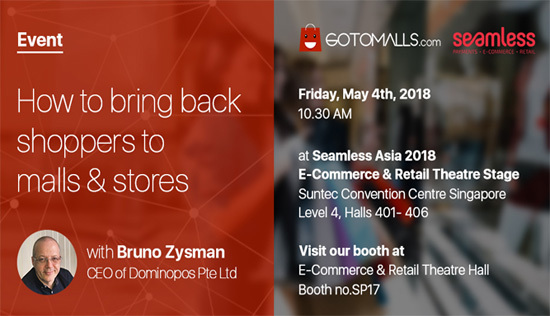 Bruno Zysman, founder and CEO of Dominopos Pte Ltd will share his vision about the digital transformation of retail industry in Seamless Asia 2018. The session takes place at E-Commerce & Retail Theatre stage, May 4th, 2018 at 10.30 AM. Seamless Asia 2018 exhibition is the largest commerce exhibition in Asia, starting from 3rd of May until 4th of May 2018 at Suntec Convention Centre, Singapore. The exhibition gathers more than 200 speakers and up to 6,000 participants, from solution providers, business executives, and senior representatives, payment experts to brands & retailers, stakeholders of commerce ecosystem in Asia. Dominopos Pte Ltd, a Singapore technology company devoted to support the brick & mortar industry has developed GoToMalls.com, a smart Malls and Stores Directory connecting online shoppers with offline stores. To face the competition with e-Commerce, GoToMalls.com offers a full-fledged marketing solution, helping brick and mortar retailers to have a proper online presence with a suite of powerful services and functionalities. During the event, Bruno Zysman will share his vision on how to re-connect shoppers with malls and store. He will showcase a range of innovations and solutions including a smart geo-located and profile based search engine helping shoppers to find malls, stores and deals near them in no time, a next-generation shopping assistant chatbot, powered by AI and deep learning algorithms, connecting shoppers with stores, and a hot deals feature offering huge discounts for consumers in a limited time to purchase products online and to redeem in stores. “Consumers will receive various benefits from GoToMalls.com. Getting the latest information chatting with the shopping assistant or buying favorite items through Hot Deals is a breeze. GoToMalls mission is to reach online shoppers and facilitate an effective and efficient offline shopping experience and to improve user’s experience in store. We are confident that GoToMalls.com will make consumers more interested in visiting malls. Retailers can also optimize these features to encourage consumers to purchase their products, for instance by running ad campaigns in a smart and powerful way,” Bruno said. GoToMalls.com launched and operates in Indonesia since July 2016. It was accessed by more than 28 million visitors, referencing 415 malls & shopping centers and more than 30,000+ stores. GoToMalls’ smart algorithm offers an unprecedented access for offline merchants especially in malls and shopping complexes to a powerful 360° Marketing suite of services, built to revive the offline retail industry. 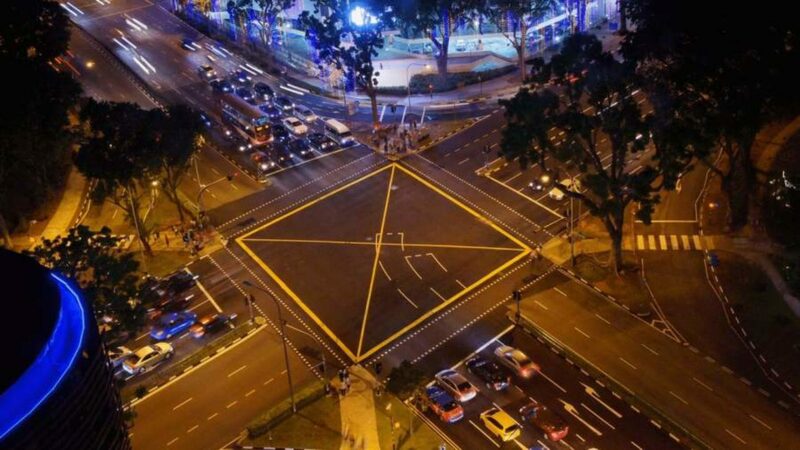 In 2018, GoToMalls.com has started to expand in Singapore. Currently referencing 106 shopping malls and 8,000 stores in Singapore, GoToMalls.com is confident to extend its suite of services and integrating cutting-edge technologies to bring back shoppers to malls and stores in Singapore. GoToMalls.com makes a breeze for its users and visitors to stay up to date with the latest promotions, discounts, coupons, offers, deals and events available from our malls, shopping centers, merchants, brands, and stores partners. Our geo-located and contextual searching features give anyone access to a personalized information. Expert in the Online to Offline (O2O) market and industry, GoToMalls.com helps malls, shopping centers, merchants, brands, and stores to reach their audience and to unlock new market segments as well as to communicate and release their marketing strategies online. GoToMalls.com stands up with and next to merchants, brands and stores to compete with the growing e-commerce channel by building a strong online to offline channel. Copyright © 2017 Dominopos. All rights reserved.